Some expat friends and I met in Recoleta to chat over lunch last week. We stumbled into Sirop Restaurant at Vicente Lopez 1661. It is a lovely bistro, and I highly recommend grabbing a bite or enjoying a dessert there. Pastries appear to be Sirop’s specialty. For an appetizer, my friends and I shared a plate of mini amuses–hot dates stuffed with manchego, green olives centrally nestled in buttery, hot pastry, and mini basil pizzas. The menu was varied for meat and non-meat eaters. I ordered eggplant- and ricotta-filled raviolis with a sauce of butter, giant capers, and cherry tomatoes. It was delicious, and just the right portion for lunch. The pasta was fresh and al dente. The capers were warm with briny flavor. My friend R. let me try a bite of her goat cheese and tomato quiche and it tasted perfectly Parisian. The crust was sublime–flaky and buttery. I am certain to order the quiche next time. (A note for the menu–Argentines call a quiche “tarta.”) Everyone shared a decadent slice of dulce de leche and chocolate ganache for dessert, concluding our conversations with cafe con leche. The ambiance was quaint and warm. Sirop’s seats are sea foam green, banquette style, and the walls are pastel pinks and oranges. The French first lady, Carla Bruni, sang romantic ballads as a background to our conversation. This is a statue from the Recoleta cemetary. 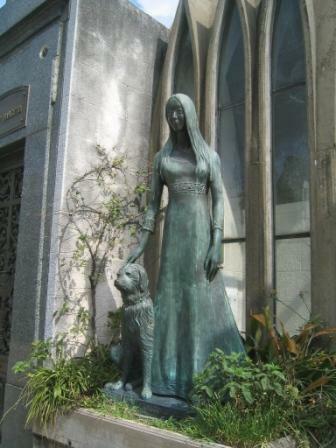 The girl and her dog would be apropos for my gravestone. That is…when I get a dog. It’s also apropos since this city loves dogs so much. I think we must live next to the premier dog lovers’ park. The dog walkers bring their herds of dogs and tie them to the trees across from each other in the morning. Dogs bark back and forth while their owners drink mate (like South American green tea) and chat with each other. Friday morning I left our apartment building to see, well, let’s just say canine sexual advances between many of the herd. Living around the dog life can be heartwarming and can drive me friggin bananas. Sometimes I want to round up and steal away with all of the dogs to be spayed or neutered. I am horrified at the lack of animal control here. Especially in the midst of amorous canine love. Before arriving, I joked about becoming a dog walker to make some extra money. I’ll be the first to admit that I would be too weak. I’ve seen women holding the leash of 15 (big) dogs. It’s not for the feint of heart. I’m still trying to catch the dogwalkers (aka dogherders) in a picture, but they’re often out in the morning. I am just too blurry eyed to get out my camera. The weather is cooling here; I think I may have missed out on the summer. The rain has chilled the city off into a fall lull. I’m listening to Roy Orbison’s “Only the Lonely” with the cool, pregnant breeze floating through our window. Our neighbors are all silent tonight. Strange that this is the witching hour. Then again, it is 2:30 at night. We’ve been going to sleep very late. I had planned to post numerous pictures today, but as I finished lunch in Palermo Viejo, a boutique area of the city, I found that our old camera has broken. It was as if the viewer had gone blind. The screen was black; the pictures I tried to take turned out black. This is especially humorous to me as I just endeavored to learn how to use it. I’m not too concerned, though, because we have a new camera in our possession. As I petulantly tried to revive the camera, I sipped cafe con leche at a coffee house around the corner from our apartment, “Petaluma.” It boasted that it is a ‘cafe for baristas.’ That sounded like the perfect fit for me. The local custom is to have breakfast of cafe con leche (coffee with hot milk) and mini croissants which they call “medialunas.” I have not done this yet, but I watched all of the locals purchasing afternoon cakes and croissants. The baristas were very kind and smiled at me, so I think I may become a regular. I’ll leave you with another dirty cat tonight from Recoleta. It’s been pouring today as it has on and off for the past three days. I actually enjoy the cool humidity it brings, but today E. and I got caught in the downpour while walking back from the Recoleta neighborhood. We walked through flash flood waters in what became cobblestone streams rather than streets. 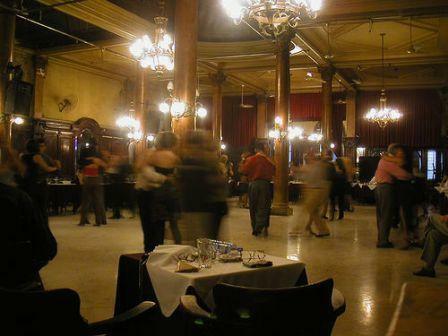 Recoleta is a distinguished upper-class enclave with a lot of European style houses. The cemetery where Evita Peron is entombed is also here. Our neighborhood, Palermo, is next to Recoleta. We met some American friends-of-friends who live in the neighborhood and had lunch, stopping at the nearby mausoleum afterwards. 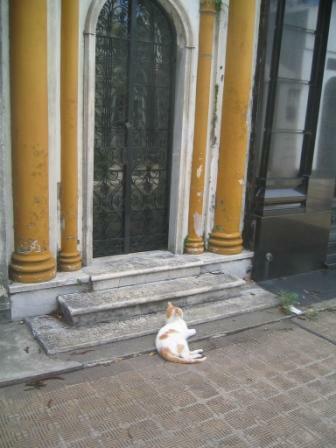 One of the most fabulous attributes of Buenos Aires that I haven’t mentioned is the number of cats and dogs in the city. Some of you may be familiar with my affection for animals and young aspirations of veterinary work. The dogs are primarily the happy side to this story–they usually have loving homes. I see more dogs than children on the street. Our American friend confessed to seeing a dog walker holding the leashes of ten dogs with a beagle bundled in his arms like an infant. Beagles seem to be the Buenos Aires mascot, followed closely to golden retrievers and miniature schnauzers. The cats’ fates are a little more dismal. They proliferate in the cemeteries and city parks. I have not found literature on cats being spayed or neutered, which is regretful. The feral cats are, however, doted upon by locals who leave leftovers and cat tidbits throughout the parks. I had an entire audience of cats in Carlos Thays Park, but I declined petting due to their questionable (infested?) fur.